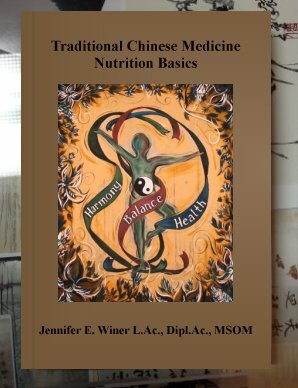 Traditional Chinese Medicine Nutrition Basics, by Jennifer Winer, LAc., is a guide to help you learn the fundamentals of traditional Chinese medicine nutrition. It also references many issues for you to research and help you be proactive with your health. There is a food journal included in the back for use to evaluate you daily intake. This is a great tool for any practitioner to use with their patient, for patients to enhance their treatment and knowledge when working with an acupuncturist and for people wanting to learn more before starting with an acupuncturist. The information in this guide is a compilation of about three consulting sessions with me which normally would come to $210. The price of the guide is only $12.95 plus shipping and handling. Wholesale pricing is available for practitioners who would like to resell this in their clinics and use this as a tool with their patients. Call 612-226-8840 for more information. (Shipping and handling fee only for United States.